At Earning Station, they're making it easy to get free stuff for playing games, taking surveys, searching the web, watching videos, and other online activities. Each time you complete an action through the Earning Station dashboard, you're earning points towards incentives of your choice including cash, games, prizes, gift cards, electronics and more. In addition to free activities like taking surveys, any shopping you do or daily deals you buy through the links on Earning Station will earn you more points for every dollar you spend. They also provide coupon codes so that you get additional savings on all of your purchases right away. Available shopping links are always changing, giving you more chances to save while earning mega points. If you shop and spend time online, this is a way to make every dollar count. 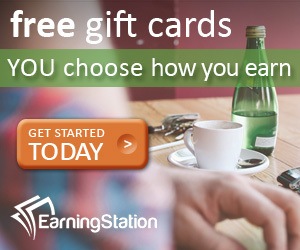 Sign up to Earning Station for free through the link below and start racking up free points.